Included is a screenshot of the error as well. Any ideas as to what went wrong? I have not seen this before. Possibly an internet connection broke in the middle of install? I've installed Eclipse and IDE software update several times recently with no . Those links are broken, not sure why you are seeing that. Are you following the steps here? I'm getting exactly the same error today on a new install. OS = Win 2k8 R2 Standard 64 bit. Have tried both Eclipse Juno (used on our production environment) and Kepler EE. Same error with both. I finally managed to install the IDE. The only difference I can fathom between failure and success was a reboot of the server between installing Eclipse and installing Wowza IDE. I am running into the same problem. I've tried rebooting and no avail. Windows 7 with Kepler. Does anyone know the fix? 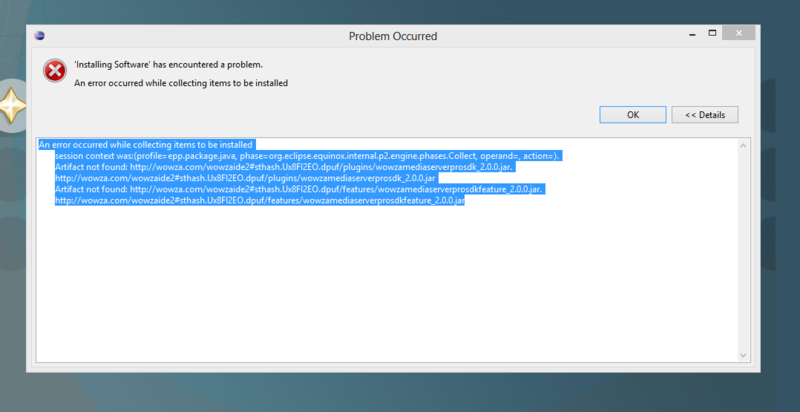 I tried rebooting and restarting Eclipse -- it didn't help (nor do I see what it would). I am now perplexed. I just tried again (have been trying for the better part of 30 minutes), and now it works. Could there be an intermittent server problem? A hiccup in the network connection during the installation could cause it to fail. I am glad to hear you have it sorted out. Thanks for the update.